In 2011, while he was out with his son, who was then 12 years old, writer David Greig read the news that Anders Breivik had killed 77 people in Norway – eight using a car bomb in Oslo, which also injured more than 200 other people, and then traveling to the island of Utøya to a summer camp for teens, where he shot and killed another 69 and injured more than 100. It’s a play that has been staged around the world, and presenting it in Vancouver are Pi Theatre and the PuSh International Performing Arts Festival. After every performance, there will be a post-show discussion and, after the Jan. 17 preview, Rabbi Laura Duhan Kaplan, director of inter-religious studies at Vancouver School of Theology, will speak about various aspects of the play. While its initial questions came from the terrorist attack in Norway, The Events centres on Claire, a priest who works and lives in her community, including leading a community choir. When The Boy attacks that choir, Claire survives the shooting, setting her on a quest similar to Greig’s – and that of most of us, when such a horrific act is committed. She needs to know, why? There are only two actors in the production. In Vancouver, Luisa Jojic will play Claire, while Douglas Ennenberg will play six characters opposite her, including The Boy, a grief counselor, the shooter’s father, a school friend of the shooter, Claire’s lover, and various others to whom Claire speaks in her effort to find understanding. A unique aspect of this play is that the choir is “played by” real community choirs, who have practised the music (score by John Browne), sing some songs from their own repertoire, and have some lines to read, but are not given the script. Jewish community member Mishelle Cuttler has the challenge of being the musical supervisor and accompanist for the local show, which is directed by Richard Wolfe. And the focus will be on the dialogue and music, without many other distractions. The Events previews Jan. 17 and runs Tuesdays to Sundays until Jan. 28, with evening and matinée performances, at the Russian Hall, 600 Campbell Ave. Tickets ($31/$26) are available from pitheatre.com/the-events. Awhile back, I was talking on the phone to my mom in Virginia. Oh, she said, your dad is busy. He’s out at the cemetery. It turned out that he had taken one of my brothers with him. The two of them used their fix-it skills to mend a broken gravestone. The next time I visited the Jewish cemetery in Alexandria, Va., my dad pointed out the neatly mended marker. The person had died 100 years before. Despite good records, they couldn’t find any surviving family to maintain the gravestone. So, my dad and brother stepped up to the job. There is so much in this portion that it’s lucky we reread it every year. The first thing I noticed is how the Hittites, who owned the land around Machpelah, honoured Abraham. They valued him so much that they tried to give him the burial land for free – but Abraham honoured them back, and made an effort to pay for it. This exchange reminded me of how careful we need to be in managing Jewish burial sites. My mom has often had the opportunity to help families who need a cemetery plot and don’t have one. “Real estate” in Jewish cemeteries can be expensive. Sometimes it’s hard to get a spot when there’s an unexpected family death. The bottom line? Nobody comes out of this alive, so let’s help each other when dealing with death. Next issue: finding the right life partner. Abraham works hard to find Isaac the right wife. Although love matches are usual these days, your family’s opinion is often pretty useful in making such a big choice. Rebekah makes a good impression. Abraham then remarries. Rashi indicates that Keturah is actually Hagar, although other commentators disagree. In any case, this brings up another issue. Some people vilify Hagar, but here it seems that some believe she and Abraham are actually a likely couple. They go on to have several more children. How does that work? When one marries again and has more children, does parenting differ? Do religious differences work themselves out? How is it that some people outlaw intermarriage, and refuse to incorporate kids from intermarried families, when it was clearly prevalent in the Bible? When Abraham dies, Ishmael helps Isaac bury him. However, Isaac’s name is mentioned first. Why? Some rabbis indicate this is because Ishmael repented and acknowledged Isaac’s superiority, even though Ishmael is older. Others indicate that, since Sarah was Abraham’s wife, her son should go first, before Hagar’s. While this sort of discussion about whose name is first seems out of date, we need only look at the succession of the British (Commonwealth) monarchy to acknowledge that we still look at birth order with some importance. How has our view of this changed over time? Also, if Ishmael is the father of Islam, was this an interfaith funeral? Or just two brothers who loved their father? This week’s portion also relates to Remembrance Day. How do we dal with profound issues of life and death? How do we confront mortality, embrace issues of loyalty and honour, while embracing our family responsibilities to the living? What are our priorities? Why? As my family walked through that old cemetery in Virginia, we passed familiar names on gravestones. My dad told stories about the different family friends he knew during their lives. My uncle, visiting from Boston, chimed in. The conversation continued. We also celebrated another important milestone in life with my uncle. He and his high school friend Don were celebrating 50 years of friendship this year, too. Someone recently said that my newspaper columns are about relationships. I’d suggest that the primary relationship I explore here is with Judaism. Many of us associate our religion with other people, in a sort of club or tribe mentality. However, what if we saw it as a tool? Imagine Judaism as a tool that helps us navigate life’s events and how to behave with others. If so, we can often use a Torah portion as a guide – just as we might do with other kinds of literature or non-fiction – on how to respectfully bury our dead, and maintain meaningful relationships with family members and also in the wider Jewish and non-Jewish communities. We can offer support, as the Hittites did, in a time of grief. We can build new or rekindle relationships, as Abraham did with Keturah. Sometimes, doing the right thing might mean repairing a gravestone for someone who is long gone. Maintaining long relationships with friends or with communities takes a different kind of work – emotional as well as physical upkeep. Do we put the same amount of effort into our relationship with understanding Judaism as well? Joanne Seiff writes regularly for CBC Manitoba and is a regular columnist for Winnipeg’s Jewish Post and News. She is the author of the book From the Outside In: Jewish Post Columns 2015-2016, a collection of essays available for digital download or as a paperback from Amazon. See more about her at joanneseiff.blogspot.com. The title of a book review in Biblical Archaeology Review caught my eye, “Ancient atheism.” I read, “A common assumption is that atheism – a lack of belief in gods and the supernatural – is a recent phenomenon, brought on by the advent of science during the Enlightenment.” I ordered the book immediately: Battling the Gods: Atheism in the Ancient World by Tim Whitmarsh (Alfred A. Knopf, 2015). Bumbling, staggering, veering and lurching: these are the words that come to mind when I think of my path towards a Jewish identity. As the product of a secular household, my only contact with Judaism was my brother’s bar mitzvah and a yearly Passover seder at a family friend’s home. I was born in 1939, the beginning of the Second World War, yet the word “Holocaust” was never mentioned during my childhood or adolescence. The topic of God was not broached. The exception to the rule was that my brother and I were sent for seven summers to a Jewish camp in the Adirondacks, in New York state. There, we became familiar with Friday night services, which included singing Jewish songs and a few prayers in Hebrew. Fast forward to 1970, after 12 years of marriage, the birth of four sons and a sincere attempt at keeping a kosher home (it lasted three years), creating Passover seders and Chanukah parties and the decision to prepare our sons for bar mitzvahs, my husband and I divorced. I enrolled immediately in courses at Concordia University. English and French literature introduced me to the Hebrew Bible and the New Testament. This led to a bachelor’s in French literature, which was followed by many courses in a master’s program called The History and Philosophy of Religion. My search was on. I was determined to find out what religiosity and devotion to God entailed. I studied Judaism (modern and medieval), Jewish mysticism, Christianity, Buddhism and Hinduism. I wrote scholarly papers on these subjects. Later, I would take up the study of Modern Hebrew at McGill University. Upon moving to Vancouver, I studied Biblical Hebrew for three years and enrolled in the Judaic studies program at the University of British Columbia. Jewish law, Jewish ethics, Proto-Hebrew, I loved it all; but I was no closer to feeling comfortable during the High Holiday services at any synagogue. I tried Conservative, Reform, Reconstructionist and Jewish Renewal congregations. I could not make that leap of faith required to pray to God. The secular humanist group had replaced Hebrew with Yiddish. I wanted my Hebrew! The result is that, every year, during Rosh Hashanah and Yom Kippur, I felt uneasy, out-of-step and different. I continued studying Modern Hebrew. I became editor of Jewish Seniors Alliance’s magazine, Senior Line. Studying, writing, volunteering and participating in the Jewish community were rewarding and gratifying activities, yet I felt like a second-class Jew. Was there something wrong with me? With Whitmarsh’s sentence, “The conclusion seems inevitable that the violent ‘othering’ as atheists of those who hold different religious views was overwhelmingly a Judeo-Christian creation,” my self-respect was restored. I now understand that I come from a longstanding tradition of atheists. My beliefs have history and credulity behind them. I will continue to study Hebrew, write, volunteer and participate in the Jewish community. In accepting my skepticism, I join the minds and hearts of the ancient Greek and Roman skeptics and atheists who came before me. The good news is we’re again debating “who is a Jew.” This is good news, of course, only because it’s a topic that divides Jews mostly when external threats abate enough to allow the luxury of pilpul around denominational rights and definitions. We can only assume that the state of the world – the Iranian threat, the unhinged American administration, Syria in collapse – looks fine enough from the Israeli prime minister’s office that we have the freedom to indulge in family squabbles. A year-and-a-half ago, the Israeli government finally agreed to create an egalitarian prayer space at the Western Wall. The Charedim who legally control Israel’s Jewish religious character, including practices at the Wall, have imposed a strict gender division on prayer and ritual at the holy site. This has sent the message to Conservative, Reform and other non-Orthodox Jews that the holy site is not wholly theirs and, by extension, that their forms of Judaism are not authentic or proper. The creation of an egalitarian section was hailed as putting an end to a painful and divisive aspect of Israeli-Diaspora relations. An egalitarian space would permit families to visit the Kotel together, allow girls to read from the Torah during their bat mitzvahs and give women the right to pray out loud, rather than following the existing rules by which women must pray quietly so that their voices may not be heard by men on the other side of the divided plaza. The agreement for a new egalitarian space would not alter the existing men’s and women’s areas, but rather add a new, third space, south of the traditional prayer areas. Last week, the Netanyahu government changed its mind and decided there is not. Bending to pressure from the ultra-Orthodox members of his coalition, the proverbial tail that so often wags the dog in Israel’s political system, Netanyahu called a snap vote on whether the decision taken in January 2016 to create the egalitarian space should indeed proceed. Ministers who last year voted in favour last week voted against. In for a penny, in for a pound, the government at the same time advanced a bill that would reinstate the Orthodox monopoly on conversions and lifecycle events, including marriage and burials. Among the implications is that Jews not converted under the auspices of the Chief Rabbinate – in other words, by Conservative, Reform or other non-Orthodox rabbis – would not be recognized as Jews. On most issues, Israel should take Diaspora concerns into consideration only secondarily to what is right for Israel. We have said in this space before, for instance, that Israeli defence policies should be determined with the security of Israelis as the priority, not the comfort of Diaspora Jews who have to live with the political consequences, but not the life-and-death consequences facing Israelis. This is different. Rules regarding prayer at the Western Wall – who, where and how – should be made with the interests of the Jewish people – not just Israelis – foremost in mind. Of course, if the rules were made with the majority of Israelis in mind, they would reflect the diversity of religious observance both in Israel and in the Diaspora. Instead, what we have is a narrow reflection of ultra-Orthodox priorities that is more a result of political realities in the Knesset than religious reality anywhere outside that chamber. Ultimately, these decisions are a result of political, not religious, considerations. The political needs of the Netanyahu government’s coalition appear to be superseding the Jewish state’s respect for diversity and pluralism within the global Jewish peoplehood. Most of us do not have a vote in Israel, but each of us has a voice. The Centre for Israel and Jewish Affairs is urging each of us to contact the Israeli embassy to express our views on this vital matter. Please do. 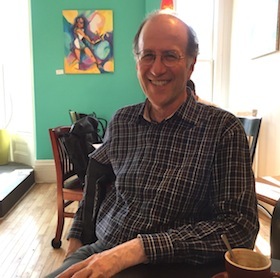 With his lean frame folded behind a small coffee table at Just Us Café in Halifax, with his large wire-frame glasses and thinning hair, Michael Chender looks somewhat like Larry David. But although Chender shares David’s sense of humour and perhaps some of his neuroticism, the soft-spoken and measured Chender embodies little else of the Curb Your Enthusiasm star’s notorious annoyance and impatience with other people. That is not a coincidence. Chender is a Jewish Buddhist, or Jew-Bu, one of a number who call Halifax home. Most of the Jew-Bus in Halifax follow a tradition called Shambhala. In Tibetan folklore, Shambhala is a mythical kingdom that represents a just and good society. It is also the inspiration for a worldwide movement, which has its headquarters in Halifax. The movement was started by Tibetan Buddhist Chögyam Trungpa Rinpoche (Rinpoche is a Tibetan honorific). He escaped Chinese-occupied Tibet in 1959 at 19 years old, already a renowned sage. According to Chender, in Tibet, older teachers would come and ask the teenage Trungpa questions. By the 1970s, Trungpa had settled in Boulder, Colo., where his Western following began to develop in earnest. He wanted to teach meditation in the West in a secular language. He taught that everyone was possessed with a fundamental goodness, and that life is worth living. A central philosophy of Shambhala is spiritual warriorship, which is accomplished by living a life of fearlessness, gentleness and intelligence. Trungpa was known for both his incredible mind and for being an eccentric. He encouraged his followers to take pride in their heritage, so on Robbie Burns Day he would dress up in a kilt and celebrate with his Scottish disciples, and he would work Yiddish phrases like “oy vey” into his lectures. In 1986, Trungpa moved the headquarters of the Shambhala community to Halifax. In 1987, he died there of liver failure at the age of 48. “He decided that Colorado was too speedy, materialistic, flashy, and that we should move to a simpler, more peaceful, calm place,” said David Greenberg, a former Jew-Bu and current Christian. He was raised outside Boston as an atheist Jew, and is conversant in Hebrew. He is the grandson of Rabbi Simon Greenberg, the founder of the University of Judaism at Los Angeles, a branch of the Jewish Theological Seminary of America. When Greenberg was 17, he started reading Trungpa’s teachings, and joined the Shambhala community for the first time at 22. He met his wife through Shambhala and, together, they had four children. Eventually, the couple divorced and, in 2009, Greenberg converted to Christianity. Nonetheless, he said he felt more Jewish when he became a Buddhist, and even more Jewish now as a Christian; it’s allowed him to appreciate his Jewishness and not just take it for granted. For example, he said, he explains the Hebrew meanings of Bible verses to his fellow churchgoers. Chender calls himself an Upper West Side Manhattan product of the late 1960s – a Woody Allen-type kid who was high-strung and philosophical, the kind who was worried about the world ending millions of years in the future. For him, being Jewish meant viewing the world through Allen’s lens, not beneath a phylactery on his forehead. Religion was never a key component of his Jewish identity – he only knew one observant family growing up – but the culture and heritage always were. He is proud of the Jewish intellectual and moral tradition. Chender knows what he likes about Judaism and what he wants to take from it. Not every Jew-Bu has such a concrete self-identity. Isaac Greenberg is David Greenberg’s son, and a university student in Halifax. He grew up speaking Hebrew, and he was raised with Shambhala, as well. After his parents divorced, his mother moved him and his three siblings to Halifax. He was 11 at the time, and he lost his connection with Judaism for almost a decade. When his mother left Shambhala, when he was 17, he lost touch with that community, too. Since then, he has been making a conscious effort to become more involved in the local Jewish scene. But he’s not entirely sure how. “I kind of feel like an outsider,” he said. As to why some Jews find their way to Buddhism, Chender said there are three common links between Judaism and Buddhism. The first one is appreciation for the critical mind, of inquiry and analysis. The second one is the importance of humour. The third is the truth of suffering. Alex Rose is a master’s student in journalism at the University of King’s College in Halifax. He graduated from the same school in 2016 with a double major in creative writing and religious studies, and loves all things basketball. He wrote this article as part of an internship with the Jewish Independent. On April 30, the leaders of the Calgary Interfaith Council were in Amman, Jordan, to receive the 2017 King Abdullah Award for World Interfaith Harmony’s first prize from the king himself. The council’s co-chairs – Rabbi Shaul Osadchey of Beth Tzedec Congregation, Debra Faulk of the Unitarian Church of Calgary and Imam Fayaz Tilley, a chaplain at the University of Calgary and board member of the Muslim Council of Calgary – were invited to attend the ceremony at the Royal Hashemite Palace. They were presented with the award by King Abdullah II. It included a cheque for $25,000 US to put toward their continuing work in Calgary. “The Calgary Interfaith Council (CIC) was reconstituted in February as part of the launch of the United Nations World Interfaith Harmony Week program,” Osadchey told the Independent. “The CIC is now the amalgamated body of five or six other smaller interfaith organizations in Calgary. It was launched as the central voice of the interfaith community here, so we decided to première that with the United Nations World Interfaith Harmony Week. They had 15 different religious communities involved in the festivities, which included interfaith breakfasts, a weekend open house, and people were welcomed into various congregations for workshops and tours. There were also two “build days,” where participants volunteered to build a house with Habitat for Humanity. At the Sunday morning awards ceremony, both King Abdullah II and Prince Ghazi ibn Muhammad were in attendance, with the latter giving a talk. Osadchey was asked to give a three-minute speech on behalf of the winning delegation. Osadchey was the first Jew and rabbi to be part of one of the award ceremonies. 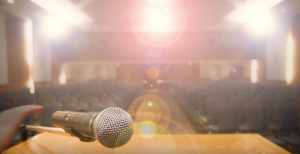 “They were very respectful, very interested and engaged in the conversation about Judaism and about the Jewish experience in the interfaith arena,” he said. “Both the king and the prince were pleased to have me as a delegate and acknowledged that the interfaith dimension of the program had taken a significant expansion by having Jews included. “I was looking forward to being able to convey some comments to the king. I began by reciting the brachah [blessing] that is said when you’re in the presence of the king or head of state. I recited it to the king in Hebrew and then translated it into English. And my comments were about how religious literacy is a necessary component for creating interfaith harmony. Osadchey said he is in the process of writing a proposal to create this youth component, and added that he is looking forward to running a youth interfaith harmony week in Calgary. He hopes that others will use his model and do likewise in their communities. Since the world interfaith award was created in 2010, said Osadchey, there have been two other Canadian cities that have won awards – Toronto and Halifax, both achieving third place in their respective years. Osadchey returned from Jordan full of hope and was impressed by the respect, interest and welcoming response of the Jordanian people he encountered. Nonetheless, he thought that, while interfaith activity might take place among the upper echelons of Jordanian society, he suspected that the general population is likely not as open or accepting. “That would have to do with probably lower levels of literacy, education, just in general,” he said. In Jordan, dialogue is mainly with the Christian world and does not seem to have any links with the Jewish world, but Osadchey is hopeful it may happen as a consequence of his visit. “We’ll see how that takes place, but they’re reaching out,” he said. “The fact that the king of Jordan is the one responsible for this initiative…. They are trying to project a different image internationally. For more information and to see more photos from the ceremony in Jordan, visit worldinterfaithharmonyweek.com/2017-prize-awarding-ceremony. Supplementary education programs, or “afternoon schools,” as they’re commonly referred to, instil teens with an understanding of their Jewish heritage, including Hebrew language teaching, Judaic curricula, social activities and an opportunity to connect meaningfully with other Jewish teens. While Hand to God does not take place in a Jewish-oriented environment (in fact, it’s in the basement of a church), it still addresses the common issues of how to teach teens the value of their religion and heritage – and it does so hilariously. Teacher Margery (the wonderful Jennifer Lines) tries to get three students – Jason, Timothy and Jessica – to pull together a hand-puppet show based on stories of the Hebrew Bible. The play starts with the youths creating their puppets and, at first, all things appear normal, but the disruptive bunch has other ideas. The brash Timothy has little interest in the puppets but attends the classes because he has a crush on Margery (and is not shy about expressing his feelings) and Jessica seems relatively engaged with the concept. The timid and introverted Jason, Margery’s son, not only embraces the use of puppets but creates a second persona – Tyrone – within his doll. Margery’s husband has recently died and Jason uses Tyrone to express the feelings of anger and abandonment he has toward his mother. While this dual identity seems rather innocuous at first – and Margery even pleads with Jason to support her in the puppet idea – it gets out of hand. Tyrone’s personality begins to overwhelm that of Jason’s until the unruly mannequin takes over entirely. At times, Jason’s extroverted alter ego is a benefit, helping him convey his attraction to Jessica. At other times, it becomes a raving maniac capable of serious destruction. As the children deal with their own issues, Margery is dealing with hers. Devastated by the loss of her husband, she feels rudderless and alone. She hopes to find some fulfilment and pleasure in her work with the teens, but that disintegrates quickly as Timothy’s advances and Jason’s/Tyrone’s shenanigans descend into chaos and violence. Meanwhile, the minister also has feelings for Margery, which puts her in an awkward position, feeling manipulated and lacking support from the one person she feels should be understanding. Lines gives a credible performance as the confused Margery; and Oliver Castillo is amazing as he carries out the simultaneous roles of Jason and Tyrone. The play is somewhat autobiographical in that playwright Robert Askins lived in a small town of conservative and religious family values. His mother actually did have an after-school puppet theatre in which Askins participated until his mid-teens, when his father died, after which he turned his back on his faith and became cynical about all things religious. Though the production will have you laughing from the start, it tackles serious issues, such as the loss of loved ones, the loss of faith, feelings of betrayal and resentment, love and forgiveness. The subject matter will have you wondering how you might deal with similar situations, such as how far do you let a child go in creating a second personality? Is it harmful or helpful, and how do you know when to draw the line? Hand to God runs at BMO Theatre Centre until June 25. Visit artsclub.com for tickets and showtimes. Warning: there is serious offensive language. Baila Lazarus is a Vancouver-based freelance writer and photographer. She teaches businesses how to get coverage in mainstream media. More information can be found at phase2coaching.com.